Another great All-on-4 dental implant case with computer guided surgery in partnership with Ira and Brandon Dickerman of Dickerman Dental Prosthetics! 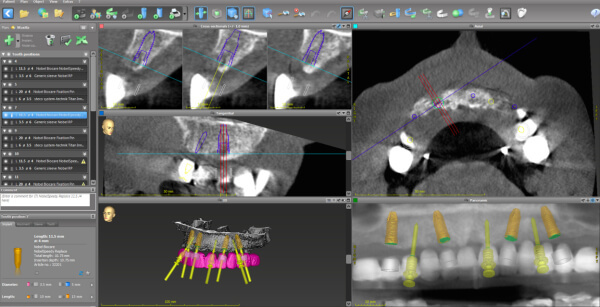 The patient was scanned in a Carestream CS 9300 CBCT scanner while wearing a surgical/diagnostic guide with radiopaque teeth. With that information, the virtual implants and other components are located within the prosthesis and bone during an online treatment planning conference session with the doctor and lab technician. The locking pins are also located which will stabilize the guide on the arch during surgery. This case was set up for the use of Nobel Biocare NobelReplace Conical Connection implants which provide maximum stability due to the tapered body design, and crestal bone preservation due to the horizontal “platform shift” of the restorative table. Of course, the proprietary NobelBiocare surgical kit must be used for the implants in this particular case. However, any dental implant that is designed for guided surgery may be used, per the choice of the surgeon, as long as that manufacturer’s guided surgery kit is utilized. The surgery typically involves minimal discomfort for the patient and can be completed in significantly less time than conventional implant surgery. These cases are cost-effective, durable, and esthetic, which vastly improves the quality of our patients’ lives.